In contrast to the bare-bones price of $115 million for each Rafale fighter, the F-35A cost $94.6 million, reports Ajai Shukla. In what would be a huge capability jump, the Indian Air Force is increasingly interested in procuring the American F-35 Lightning II for its depleting fighter fleet. 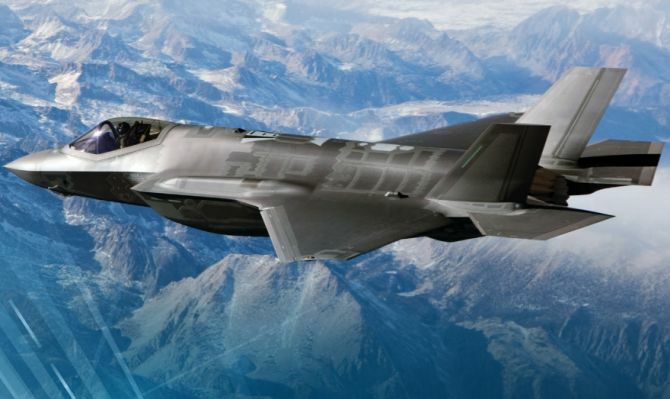 The IAF top brass is formally requesting a classified briefing by the F-35's prime builder, Lockheed Martin, on the capabilities of the sophisticated, fifth-generation fighter developed under the United States Joint Strike Fighter programme. A classified briefing would require formal clearance from the US department of defence (the Pentagon) and the state department. The grant of such a clearance would be an important first step towards permitting the sale of F-35s to India. It is learnt the IAF wants to procure 126 of the variant called F-35A -- the air force version of the fighter that incorporates 'conventional take-off and landing'. Another variant, the F-35B, incorporating 'short take-off and vertical landing', has been developed for the US Marine Corps. The Indian Navy, which has never ruled out operating the F-35 off Indian aircraft carriers, received a briefing on the F-35 as far back as 2010, Lockheed Martin official Orville Prins told this correspondent. However, at that stage, the F-35 was still grappling with serious development challenges. The F-35's affordability is also attractive for New Delhi. In contrast to the bare-bones price of $115 million for each Rafale fighter (with India-specific enhancements, spares, logistics and weapons all extra), the F-35A cost customers $94.6 million last February. Lockheed Martin says it will reduce the cost to $80 million by 2020. A fifth-generation fighter is characterised by a 'stealth design', making it far more difficult for radar to detect; 'supercruise', or the ability to fly at supersonic speeds without engaging engine afterburners; and highly networked avionics that detect and engage enemy aircraft using a range of sensors and weapons across the battle-space. The only true fifth-generation fighters in service are the US Air Force's F-22 Raptor and the F-35 Lightning II. China is developing two stealth fighters -- the J-20 Chengdu and the J-31 Shenyang. Russia is developing its own fifth-generation fighter, the PAK-FA, and has offered India a partnership role in developing the PAK-FA into the eponymous Fifth Generation Fighter Aircraft -- FGFA -- for the IAF. Negotiations on roles and costing are over, but the Indian defence ministry is yet to accept. The United Progressive Alliance's defence minister A K Antony had ruled out buying the F-35, stating that India would meet its short-term requirement of fifth-generation fighters with the FGFA. For the IAF's long term needs, the Defence Research and Development Organisation is developing the advanced medium combat aircraft. Sources close to the Pentagon say India would not be sold the F-35 as long as it is partnering Russia in the FGFA co-development project. That is because Washington would guard against the leakage of F-35 technology into the FGFA. Senior officers say the IAF is not enthused about the FGFA project. They point out the F-35 is further advanced in development and has already entered service with the USAF and six or seven air forces of American allies. For Lockheed Martin, an Indian request for the F-35 would create a dilemma. The US company would rather have the IAF buy the F-16 Block 70, which it has offered to build in India in partnership with Tata Advanced Systems Ltd.
For Lockheed Martin, that would keep alive the F-16 assembly line, which has long functioned from Fort Worth, Texas, and has now moved temporarily to Greenville, South Carolina, where it is building a $2.8 billion order from Bahrain for 19 F-16V fighters. The Fort Worth facility has been made over to building the F-35, of which over 3,000 are already on order. Meanwhile, the assembly line in India would build new F-16s for the IAF, as well as for orders that Lockheed Martin expects from southeast Asian and central European countries. It would also provide overhaul and upgrade facilities for the estimated 3,000 F-16 fighters in service worldwide, in some 25 air forces. Lockheed Martin calculates that an Indian line would benefit, in the medium term, from new fighter orders worth $16 billion, and $6.5 billion in upgrading old F-16s. Simultaneously, American jobs would get a lease of life, as F-16 suppliers in the US would continue feeding into the integration line in India. At least 50 per cent of the F-16s by value would continue to be made in America. For all these reasons, Lockheed Martin is painting the F-16 Block 70 sale to the IAF as a stepping stone to eventually obtaining the F-35. While the US has supplied the F-35 only to close allies, Washington insiders say India's recent designation as a major defence partner, and a groundswell of goodwill towards New Delhi, make conditions propitious for an Indian request. An indicator is the recent permission granted for the sale to India of the Sea Guardian unmanned aerial vehicle -- so far sold only to close allies. In 2011, the influential US Senate Armed Services Committee requested the Pentagon to study the feasibility of an F-35 sale to India. Senators John Cornyn (co-chair of the Senate India Caucus) and Joseph Lieberman spearheaded the proposal. But US officials in Washington also complain about fatigue at New Delhi's tardiness in following up discussions with formal requests. The defence ministry and the IAF have not responded to an e-mailed request for comments. F-16 or Gripen E: What will Modi choose?